Head and shoulders of the statue on public exhibition in Paris, 1876. 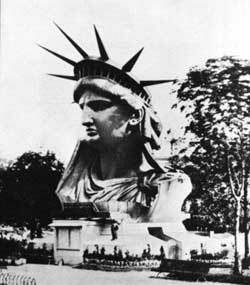 DURING ALL THE furore of fund raising and pedestal building in the United States, Bartholdi in France had continued to work on his colossal statue. In a letter to the chairman of the American Committee, dated December 19, 1882, he wrote: "Our work advances. The Statue commences to reach above the houses, and by next spring we shall see it over-look the entire city, as the large monuments of Paris now do." By 1884, all the pieces of the statue had been put together and it stood a veritable colossus overlooking all the roof tops of Paris. It could have been completed in 1883, but since the pedestal was not ready for it, work on the statue was slowed a bit. On June 11, 1884, Levi P. Morton, the Minister of the United States to France, gave a banquet in honor of the Franco-American Union and in celebration of the completion of the statue. Present were many of those who had been most interested in the movement. Missing was Eduoard de Laboulaye, who had died in 1883. 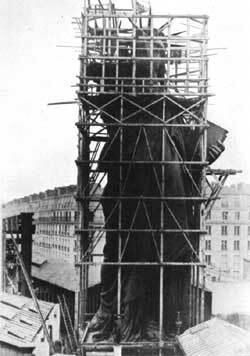 The Statue of Liberty near completion in Paris. From "Album des Travaux de Construction de la Statue Colossale de la Liberte destinee an Port de New-York," 1883. At the banquet it was recalled that Bartholdi had given 10 years of his life to the great work, putting into it both his ability as a sculptor and his love of freedom. July 4 was the day selected for the formal delivery of the statue. On that day Count Ferdinand de Lesseps, builder of the Suez Canal, who had succeeded De Laboulaye as president of the Franco-American Union, presented to the United States, through Minister Morton, the colossal Statue of Liberty Enlightening the World. This is the result of the devoted enthusiasm, the intelligence and the noblest sentiments which can inspire man. It is great in its conception, great in its execution, great in its proportions; let us hope that it will add, by its moral value, to the memories and sympathies that it is intended to perpetuate. We now transfer to you, Mr. Minister, this great statue and trust that it may forever stand the pledge of friendship between France and the Great Republic of the United States. The American Minister, ending his acceptance speech, said in part: "God grant that it [the Statue] may stand until the end of time as an emblem of imperishable sympathy and affection between the Republics of France and the United States."